In The Walking Dead Encounter, fans can place walkers in the real world, and share the images and videos via social media. Walking Dead fans won’t have to wait until the Season 8 premiere on Oct. 22 to get up close and personal with zombie walkers. 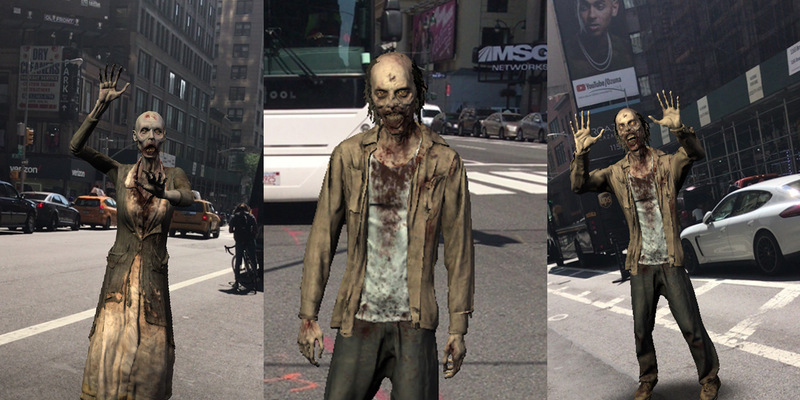 AMC and Mountain Dew have teamed up for a new augmented-reality app, The Walking Dead Encounter, which will let users place walkers in the real world, in both still photos and video, and share the AR creations on social media. The Walking Dead Encounter is the centerpiece of an extensive partnership between AMC and Mountain Dew, which spans the first half of The Walking Dead’s eighth season. The show’s most famous characters—Rick Grimes, Michonne and Daryl Dixon—will appear on more than 100 million Mountain Dew products, including single-serve 20-ounce bottles and 12-ounce, 12-pack cases of Mountain Dew, Diet Mountain Dew and Mountain Dew Pitch Black packaging. The app, which is available today on iOS and Android devices, comes with two walkers. 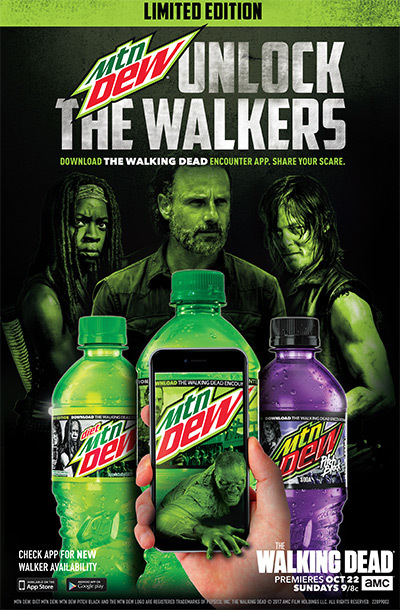 Consumers can unlock additional walkers by watching Mountain Dew commercials during each of the eight episodes in Season 8’s first half or by scanning the Mountain Dew-Walking Dead merchandise in retail locations. “You’ll get new walkers each week, whatever experience you participate in,” for a total of 20 in all, said Melissa Wasserman, svp of client solutions and integrated marketing at AMC. 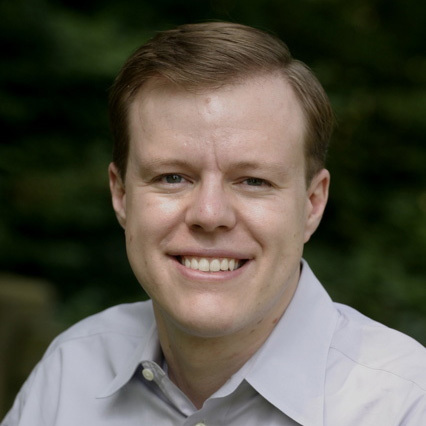 The deal grew out of a request for proposals Mountain Dew’s parent company, PepsiCo, held a year ago with AMC and other TV and digital outlets. AMC’s digital team came up with the idea for the AR app and worked with an outside firm, Trigger, to develop it. AMC and Mountain Dew held a soft launch for the campaign during their “Deadquarters” activation at Comic-Con, where fans could use the app on a few phones and share their images via social media. It generated “a lot of excitement,” said Collins, who added that “people kept walking away with” the prototypes of the Walking Dead-Mountain Dew bottle and can packaging on display. The companies created three different spots—featuring basketball, skateboard and BMX—which will air throughout the first half of The Walking Dead’s season. AMC has previously teamed with Hyundai and Microsoft for The Walking Dead—which remains TV’s No. 1 show among 18- to 49-year-olds—but the Mountain Dew deal is its most elaborate partnership for the show to date. The Walking Dead Encounter App from Simon Landon on Vimeo.